ThinkHammer: A Wearable Reminder of My Strengths. What Works for You? A Wearable Reminder of My Strengths. What Works for You? I've been thinking a lot lately about playing to my strengths. The thing that makes the idea powerful is actually finding ways to complement your weaker points making sure those things still get done. I got to thinking about this because I've got a Mastermind group that is using the Strengths Finder 2.0 book to make sure we've got everyone on track. I have found it too easy to spend too much time on stuff I am not good at. That has kept me from making the progress I would like to make at the stuff I can do well and easily. It was the right message at the right time for me. I think it's helping others in our group as well. 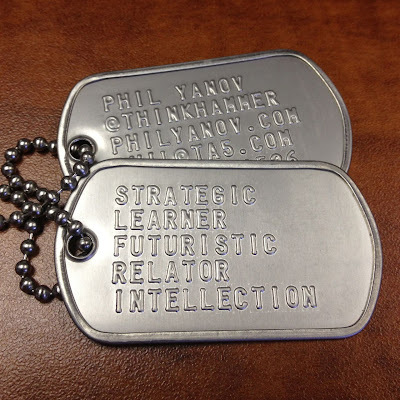 Since I can sometimes get sidetracked, I got my strengths stamped onto something I can wear round my neck. I'd love to hear what little things you do to keep your thoughts focused on the ideas that are important to you.